During my first visit at Pasig, we brought 1 cooler chest full of pasteurized milk. There were probably about 77 bottles there but we only used 3 bottles. 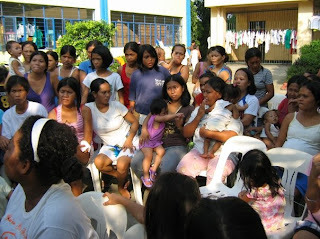 All of the mothers we talked to (with the exception of about 3-4 mothers) were breastfeeding. Although some of them were mixed feeding, these mixed feeders were lessening the formula milk intake of their babies and were slowly going back to exclusive breastfeeding (due to lack of clean water). The 3 bottles of milk were used not because there were babies who needed the milk but because they had been thawed and couldn’t be re-frozen. The breast milk was instead fed to toddlers who loved the milk! 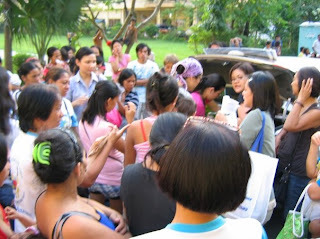 During the drive organized by the Philippine General Hospital a week before, the group brought 2 cooler-chests of milk. But as reported by my co-LATCHer Mec, a lot of moms were already breastfeeding exclusively or mixed. Thus the thawed milk ended up also being given to toddlers. Apparently, breastmilk drive was not of utmost importance but rather it was the information or encouragement to go back to exclusive breastfeeding that was needed by the moms at the evacuation centers. Moms who were exclusively breastfeeding also needed to be praised and protected as there were some ignorant donors who were donating formula milk (see next paragraph!). Just because they are an international organization doesn’t mean that they know what to do. Going on breastfeeding missions is not included in the regular activities of LATCH. We are primarily a support group who counsel mothers. We were requested by a big international organization to work with them and the local government units to visit the evacuation centers as volunteers. We were pretty new at this kind of thing so during our first visit, we were somewhat unprepared. We had our own transportation, made our own visuals and prepared our own giveaways. For the second visit, we had more time to prepare and were able to make loot bags with laundry soaps, a child’s shirt and sanitary napkin, to give away. One of the LATCHers also prepared bihon for the participants. These may seem meager but money for these goods came from our own or our friends’ and families’ pockets -- and this was after most of us had donated to other civic organizations who earlier called for relief goods donations. This international organization dictated the places we were supposed to go to. They even asked the volunteers to go to Sta. Rosa which is about 1.5 hours away from Metro Manila. Now, we are volunteer moms who have full-time jobs or run a business or take care of our houses. Some of the volunteers are community moms who need to work to put food on their tables for the next day. Thus, we asked that our transportation fees be reimbursed and that this international organization prepare the loot bags. 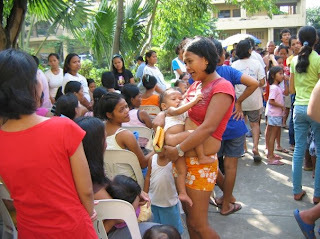 For the community mothers, we asked that they be given at least P1,000 (roughly USD$20) for a day's work. The international organization balked. Apparently, they had already given a huge amount to another international children's organization who had no clue about breastfeeding. This international children's organization, in turn, turned to various breastfeeding counselor groups, asking them to work almost gratis. And this international children's organization even had the nerve to suggest formula donations - when the numbers show that the exclusively breastfed children greatly outnumbered the formula-fed or mixed-fed babies! For the initial Sta. Rosa mission, the group agreed to go in exchange for transportation to be arranged by the international organization. They had also promised to prepare the goody bags but since we had been able to solicit and make 500 bags, we told them that for this mission, they just needed to prepare the transportation. Meeting time was 730am on a Saturday to allow the group to get to the site before 10am and be back in the city in the afternoon. 10am - and the group was still waiting for the non-existent transportation promised by the international organization!! Needless to say, the mission for that weekend was cancelled. The mission eventually pushed through about a week later but this time, the blinders were off and we knew and emphasized that this mission is by our group and not in partnership with any other organization. Finally, we learned that when doing the missions, we needed to bring goody or loot bags to the mothers. These moms lost almost everything and although they were not doing anything, by participating during the talks, they feel that they contributed something and needed to be "paid." During the first mission, it was quite chaotic since we brought whatever we could find - mix of clothes, bedsheets, toys, soaps and toiletries. The moms wanted to exchange what they received and kept comparing what their neighbors got. For the next missions, we knew better and prepared standard loot bags for the moms. Most of the evacuation centers have been cleared out as the government has implemented a "Balik Probinsya" (return to the province) program. As a result, there were a couple of missions cancelled because the evacuees were no longer there or were too busy packing. With more typhoons predicted to come to the Philippines, I expect that we might be called to volunteer again in the future. Our experience with Ondoy has opened up our eyes to several realizations and prepared to us better for future missions. But for now, our organization has decided to move on and focus on our primary mission/purpose which is to counsel and support breastfeeding moms. Wow! An international children's organization that knows nothing about breastfeeding?! That's some scary stuff. You and your group are amazing Jenny. Bravo for going out and talking about re-establishing exclusive breastfeeding. I think the work you are doing is spectacular.